Those pesky Hildiridarsons are up to their same old tricks in this episode, causing further tension between King Harald Fairhair and the rapidly rising Thorolf Kveldulfsson. When King Harald learns that Thorolf has a large cargo ship laden with expensive English goods returning to Norway, he dispatches his most-trusted henchmen, Sigtrygg Travel-quick and Hallvard Travel-hard, to intercept and seize the ship. With that betrayal things reach a breaking point between the two men. Will Thorolf make the right moves and restore his lord's faith in him, or will he light the match that brings about his own destruction? 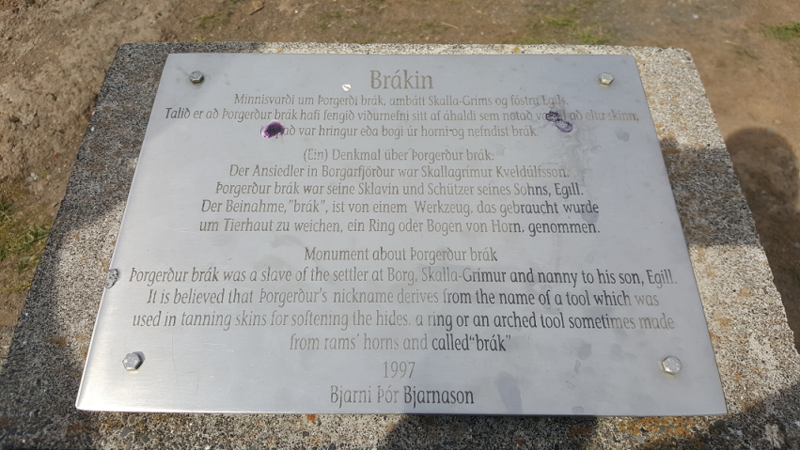 Along the way, we talk about the theme of kingship in the saga, the logic (or lack thereof) behind Thorolf's choices, the value of understanding Scandinavian geography, some interesting nicknames, and the effects of a berserker rage. Somewhere in there we manage to toss in some references to old movies, Thundercats, and "Yakety Sax." Join us for the fun. 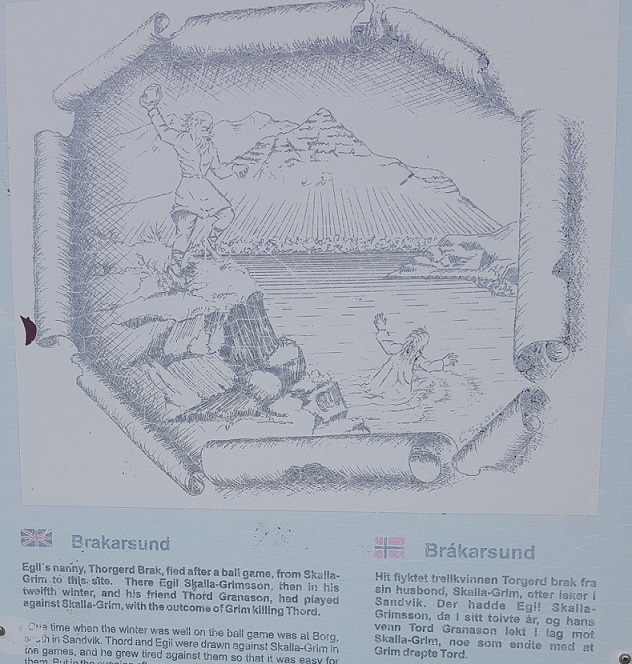 If you'd like to better appreciate the action and landscape of the sagas, we highly recommend Dr. Emily Lethbridge's fantastic Icelandic Saga Map. It allows you to get a sense of distance, landscape, and place. Because we talk about berserks briefly in this episode, you might want to learn more about the subject. While we have talked a lot about berserks over the years, we've never devoted an episode to them. But you're in luck. 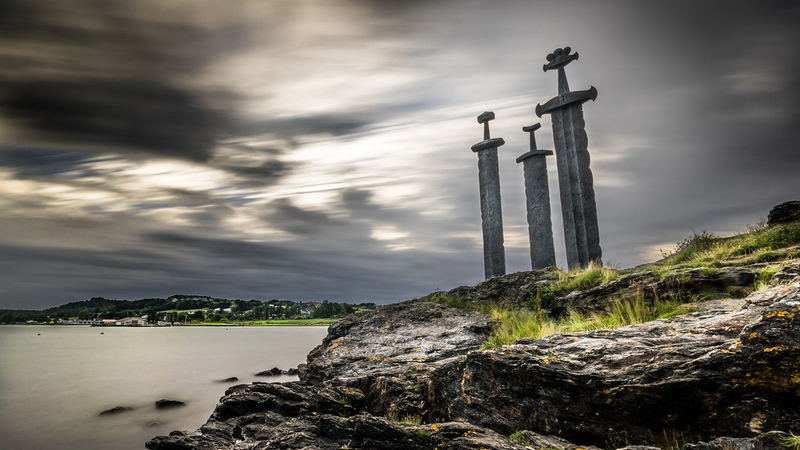 For more on berserks, check out Noah Tetzner's interview with Roderick Dale on The History of Vikings Podcast. 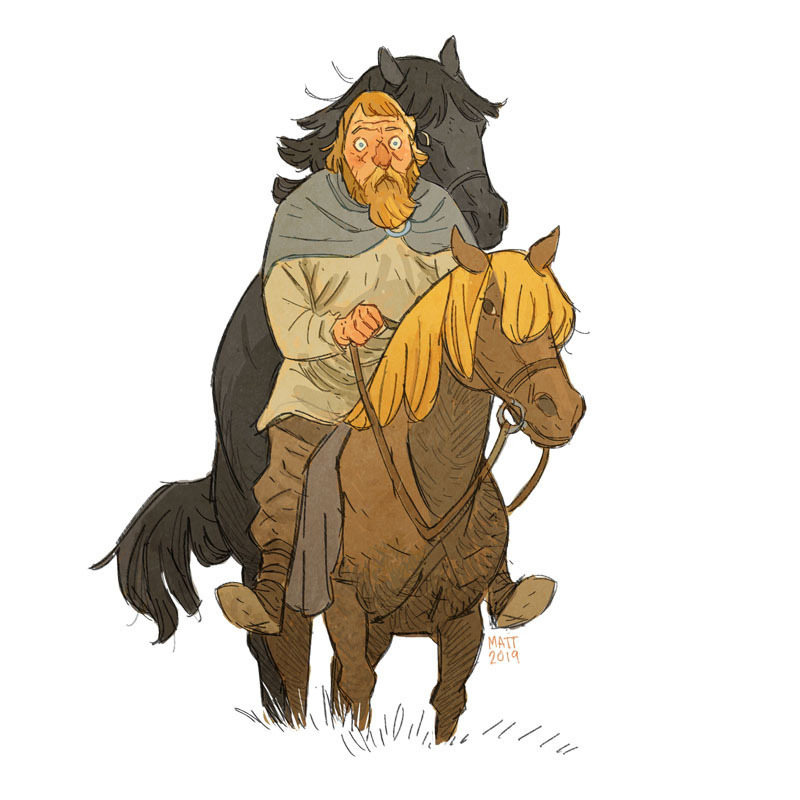 Our journey through Egil's Saga continues with chapters 7-15. This time, we're following the meteoric rise of Thorolf Kveldulfsson. Against his father's better judgment, Thorolf makes his way to the court of King Harald soon-to-be Fairhair. It's no surprise to anyone when Thorolf distinguishes himself and becomes Harald's most trusted and successful follower. But like Icarus, Harald flies too close to the sun. With all his success, he's managed to gather extensive landholdings, abundant wealth, and a lot of followers. Before long, rivals at court are working to undermine him and sully his good name with King Harald. Who are these rivals? What cause do they have to hate this paragon of Norwegian virtue? And will King Harald fall under their spell? There's only one way to find out! 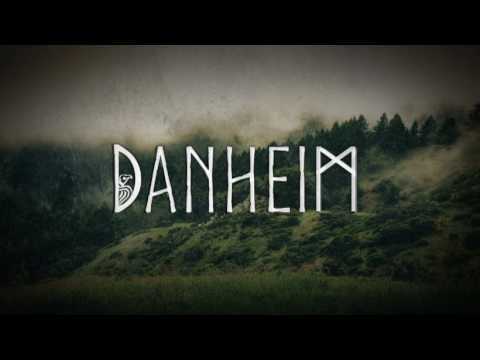 This episode includes the famous and decisive Battle of Hafrsfjord, where King Harald vanquishes his enemies and unites Norway (at least a significant portion of it) under a single crown (or so legendary history would have us believe). The battle places Thorolf, Olvir Hump, Eyvind Lamb, and their new fried Bard Brynjolfsson at the prow of King Harald's ship. We've covered this battle before, but never from this perspective. Perhaps you'll encounter a familiar face on the enemy side if you pay attention. If you'd like to dive into the scholarship used to prepare this and other Egil's Saga episodes, visit the bibliography page on our blog site. Thanks again to Matt Smith for another original illustration. If you enjoy Matt's work for Saga Thing, you'll want to keep up with his latest doodles, drawings, and projects on Twitter. A few months ago we once again put the fate of Saga Thing in your hands. 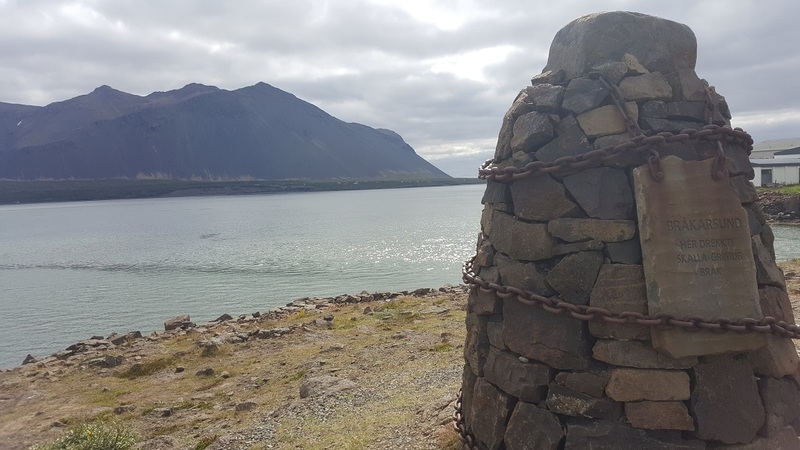 You had the option to choose our next saga, selecting between two of Iceland's greatest literary monuments and The Saga of the Foster-Brothers. The will of the people was made manifest and we got to work. You've been waiting patiently. Join us now for the first of many episodes on our listener selected saga of 2019, Egil's Saga. In this episode, we cover chapters 1-6. Here the dramatic tension revolves around King Harald Tangle-Hair's rise to power as he seeks to become sole ruler of Norway. 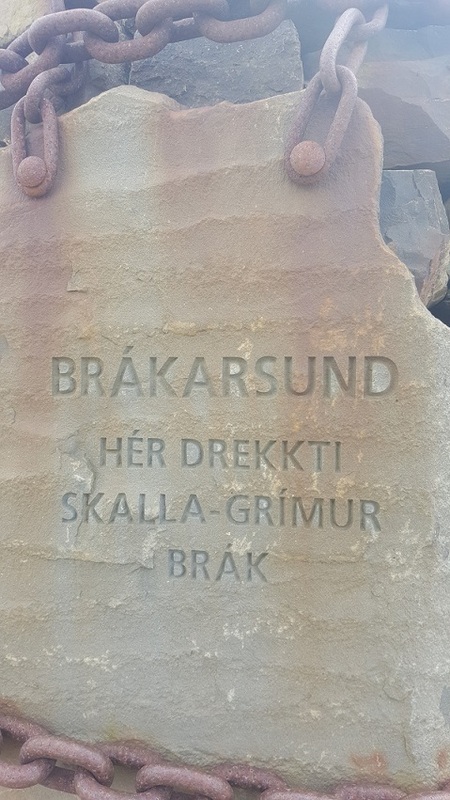 One by one, the best men of Norway fall like dominoes before him, dying in battle, fleeing to new lands, and even burying themselves in mounds to avoid submitting to King Harald. Some embrace the seemingly inevitable and join the swelling ranks of King Harald's supporters. You won't run into Egil Skallagrimsson in this episode. This one is all about setting up the world into which he will be born. 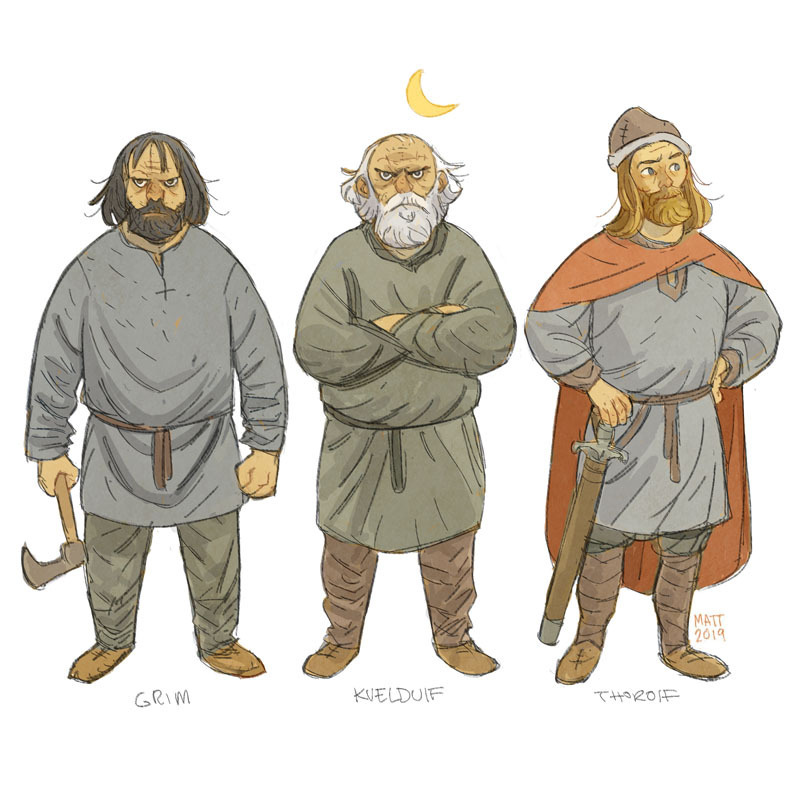 But you will meet Egil's grandfather, Kvelduf, his father, Grim, and his uncle, Thorolf. 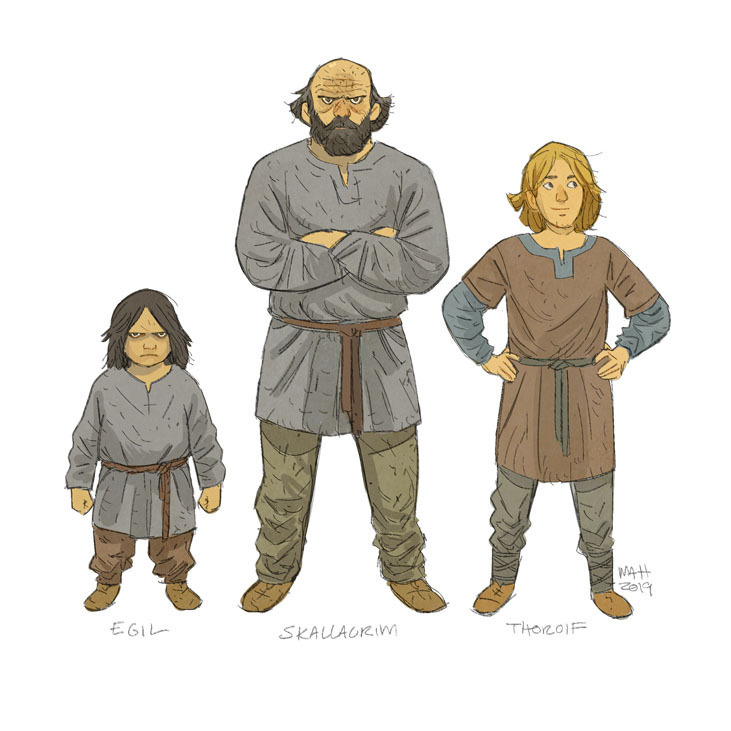 You'll also meet Kari of Berle, Kveldulf's best friend, and his sons Eyvind Lamb and Olvir Hump. How will these men respond to calls to either join Harald or risk their lives fighting against him? There's only one way to find out (assuming you can't read the saga yourself for some reason). Please feel free to submit any questions or comments you'd like us to address from this episode. We'll set aside some time at the end of each episode going forward to tackle those. You can send them to us via email, twitter, or facebook. 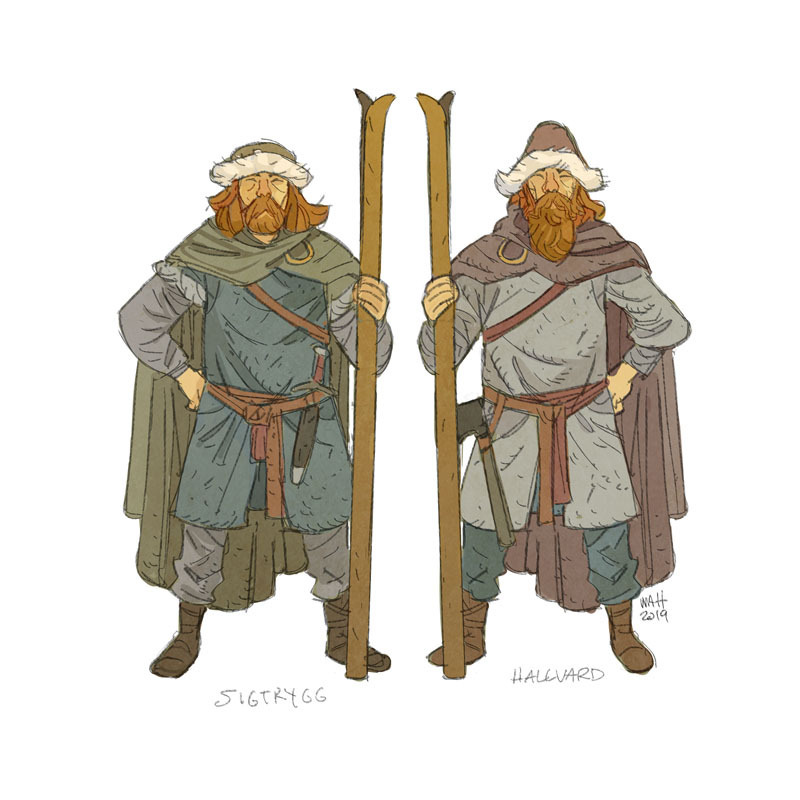 When you're finished, be sure to check out our Select Bibliography for Egil's Saga on our blog site. There you'll find citations for all the articles and books we mention throughout our journey through Egil's Saga. We'll be adding to it as we go. 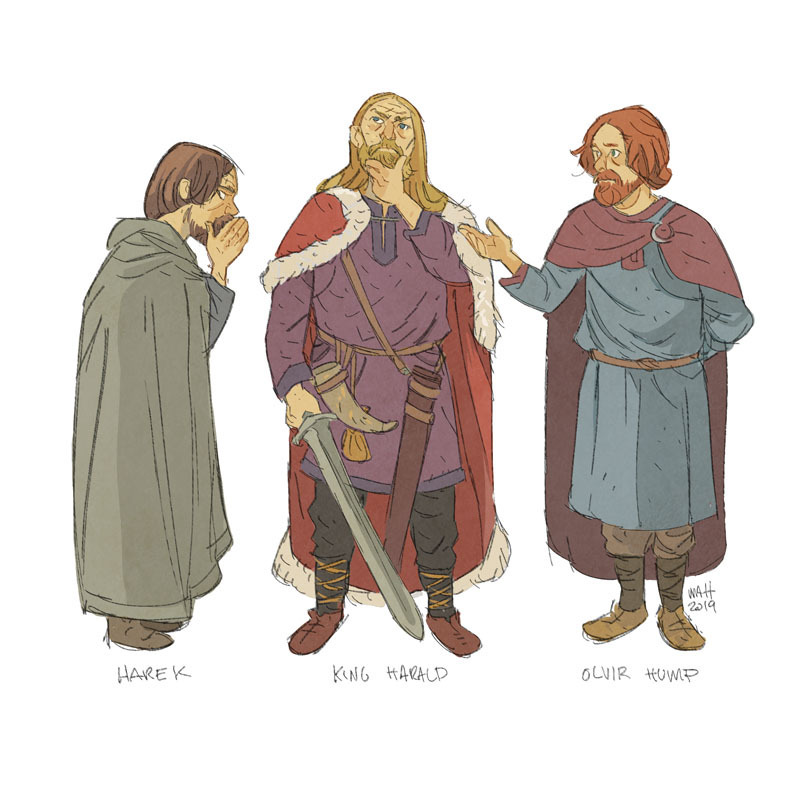 As always, a special thanks to our Saga Thing illustrator, Matt Smith for the portraits of Kveldulf and his sons. We look forward to seeing what he does with the rest of Egil's Saga. If you like the work Matt's been doing for us, check out his latest project Metal Quest, a collaboration with Tom Pappalardo. You can keep up with Matt's latest doodles, drawings, and progress on Twitter. In this episode, Thorhall Ale-Hood burns down his woodlands making charcoal. Unfortunately for him, he also burns down the neighboring woods that belong to 6 of Iceland's most powerful chieftains. The woods aren't terribly important to them, but when Iceland's bully chieftains see a financial opportunity, they take it. This short saga tells the story of Ale-Hood's attempt to defend himself against the chieftains. If you liked Bandamanna Saga, then you'll love The "Saga" of Ale-Hood. It's a quick one, but it's full of laughs. Thanks, as always, to Matt Smith for another original drawing. This one depicts Thorkel Fringe, one of the saga's bad guys, in a compromising position. Listen to the episode to find out more. You can visit Matt's webpage and follow him on Twitter to see more of his work. We managed to do both the summary and the judgments for this one. It's been a while since that happened. Judgments start at 1:03:31.